An 85th-minute equaliser by Syria's Omar al-Soma (top) raised harrowing memories of the 1997 play-offs, when Australia drew 1-1 with Iran in Tehran but were held 2-2 at home to go out on away goals. 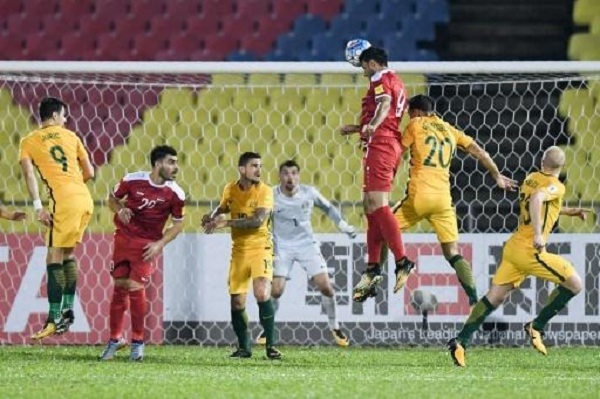 MALACCA (MALAYSIA) - Australian players and media slammed the referee after Syria's controversial late penalty dented their hopes of reaching next year's World Cup following a 1-1 play-off draw in Malacca. The Socceroos remain in the box seat ahead of Tuesday's second leg in Sydney, where the eventual winner will go into a final play-off with the CONCACAF federation's fourth-placed team. But Omar al-Soma's 85th-minute equaliser raised harrowing memories of the 1997 play-offs, when Australia drew 1-1 with Iran in Tehran but were held 2-2 at home to go out on away goals. Forward Robbie Kruse even claimed Iranian referee Alireza Faghani -- who farcically gave him a yellow card when he went down with a serious injury in the 2015 Asian Cup final -- was itching to give the penalty. "It was evident to everyone it wasn't a penalty," Kruse told Australian media, adding: "You expect that from this referee, we've had him before. "I think he wanted to give it as soon as he made contact." Socceroos coach Ange Postecoglou said he was "bemused" by the decision, while Leckie called it "very poor". "It wasn't like I (made) body contact and tried to put him off, I actually won the header. I don't know what went through the ref's mind to give a penalty," Leckie said. "Everyone's pissed off about the whole situation because I think everyone in the world that watched the game knows it wasn't a penalty." The Herald Sun said Australia were "robbed" of victory, while one Fox Sports columnist questioned the wisdom of using a referee from Iran, which has close ties with Syria. More worryingly for Australia, they were under the pump for much of the second half, when Soma had a header deflected on to the post and Omar Khribin saw a free kick flash just wide. Postecoglou said his team had struggled with Malaysia's hot and humid conditions but that it would be a different story in Sydney, when he can call on a number of fresh players. "We want to play really high-tempo and really go at them and test them," Postecoglou said, adding: "We won't make tactical changes but we've got some players that didn't play tonight who are in good form and good condition. "We'll make some changes to the XI. When we're at home we want to attack aggressively. They've got to score a goal, they've got to open up a little bit at some point. We'll make sure we take advantage of that." Australia, who joined the Asian Football Confederation in 2006, are attempting to reach their fourth straight World Cup and fifth overall. Syria are striving to make their World Cup debut after a fairytale qualifying run that has defied the raging civil war in their home country. Australian players and media slammed the referee after Syria's controversial late penalty dented their hopes of reaching next year's World Cup following a 1-1 play-off draw in Malacca.